Not only did Harmonix help turn the rhythm genre into big business; the studio also inspired different developers to take the basics of music gaming to new heights and down different alleyways. 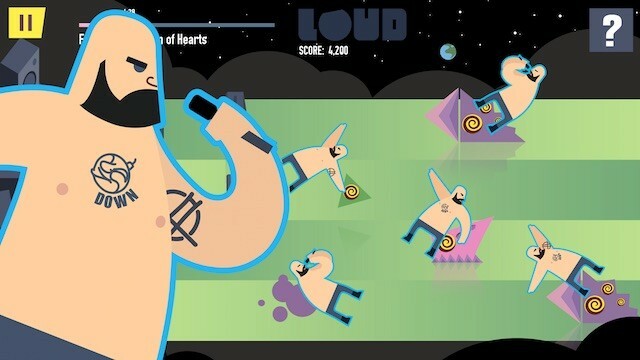 A good example of this is the newly-released LOUD on Planet X, which comes to PlayStation 4, PC and mobile through Toronto-based Pop Sandbox. Mixing basic tower defence mechanics with rhythmic lane shooting and great Canadian indie music, it’s an interesting combination that is worthy of your time and money. Although it’s technically set in my city, Toronto, Ontario, LOUD on Planet X is an intergalactic affair. Things begin at Toronto’s Horseshoe Tavern — a popular place for independent artists and their fans — with a very barebones and surprisingly poor tutorial, before players are sent out into the game’s pseudo-campaign, which is set-up as a list of approximately forty different songs. There’s no story to this game, but that’s to be expected. After all, this is an independently produced music game, and a story isn’t exactly necessary. All of the bases are covered, though, and you’re simply expected to assume that an alien invasion has taken place. One which happens to (quite literally) have its eyes set on some of Canada’s most popular and most well-liked indie bands. What’s most impressive is the soundtrack that Pop Sandbox has compiled, because there’s nary a bad song to be found. While a couple of the tunes don’t stand out as much as their peers, the majority of what’s on offer is a delight to listen to. There’s Tegan and Sara’s catchy “Closer,” Metric’s “Youth Without Youth” and “Breathing Underwater,” and July Talk’s fantastic “Guns + Ammunition,” to name a few. Each of the game’s bands and artists (a list that also includes Chvrches, F*cked Up, Cadence Weapon, Shad, Health, Little Dragon, Lights and Purity Ring), has contributed two different songs to said tracklist, and each one fits in well with what the developer has designed. That is, even though some of the songs are faster than others, while a few happen to be from a completely different genre than their peers. I’m talking about the rap tracks from both Shad and Cadence Weapon. 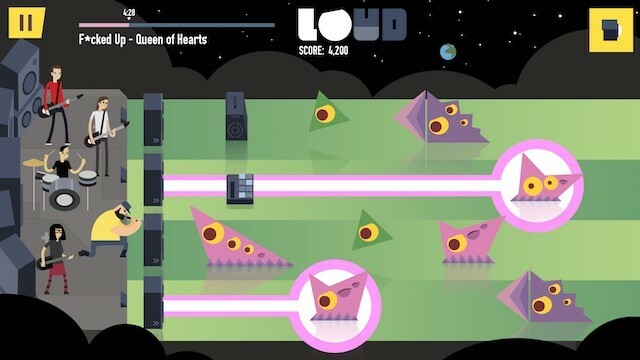 LOUD‘s gameplay is rather similar to that of Rock Band and Guitar Hero predecessors Frequency and Amplitude, both of which were great titles during the PS2 era. However, instead of changing lanes to play different instruments, your goal is to protect your stage from an onslaught of varied alien attackers whose health is gauged by the amount of eyes they possess. This is done by pressing the proper buttons to fire lasers across horizontal lanes, of which there are four. The basic idea here is that each lane is assigned a couple of different buttons; one of which corresponds to the game’s left-handed control scheme, and one that corresponds to its default, right-handed scheme. On the right-hand side, the top lane requires R1, the second one is assigned to triangle, the third uses either circle or square, and the bottom one uses X. Conversely, those who are more dominant with their other hand, can use directions on the d-pad as well as L1. What you want to do is watch your lanes and attack whenever you see an alien slithering towards your stage and its protective speakers, which can only take a certain amount of hits before they fail. Hitting a lane’s assigned button will fire a horizontal laser across it, but this only works if you time your press to the beat of your chosen song. Failure to do so results in a misfire, and that means lost time. The gameplay is pretty simple, and doesn’t have a lot of extra bells and whistles. There are, however, some special attacks, including a full screen blitz that can be unleashed after the player fills his or her LOUD meter through successful hits. Building up combos also reflects in on-screen filters, plus an image that shows in the corner of the screen. When this happens, you can hold the same two buttons you’d use to pull off your special, screen-clearing attack, along with one specific lane button. What this does is drop a special item into that lane, be it a shield-like amp, a stunning spotlight, blinding camera flashes, or a surly bouncer. What’s key, though, is not only keeping the beat of each song, but also watching to see which types of aliens are coming at you. The basic ones aren’t too scary, but some can slither from lane to lane, or burrow underground. Hell, one variant has a shield, while another turns into two small enemies when destroyed. If you’re rhythmically challenged like I am, you may find this difficult, and will want to start on Easy as a result. LOUD on Planet X has three different difficulty options, but its Easy mode is far from that and its Normal can be a difficult challenge. Either way, the final battle is no slouch, as it combines multiple songs with a mixture of traditional aliens and a four-tentacled beast of a boss. This means that you’re forced to quickly adapt whenever the music changes and get used to an altered tempo without much notice. This can be tough, and a bit frustrating in and of itself, but it’s made more annoying by the glitches that present themselves. In fact, it wasn’t until I got to the final stage that I noticed any major problems with this otherwise well-performing game. The first time I failed to beat the boss (it took a handful of tries to get used to, I’ll be honest), the screen went black. I could hear the cursor’s tick when I moved it, and when I pressed a button the stage reloaded, but it was a glitch nonetheless. This actually happened after each failure, and was accompanied by a bit of lag during the fight itself, which didn’t make things any easier. Prior to this, the only technical problem I’d encountered was a song attempt wherein the pause button wouldn’t work. 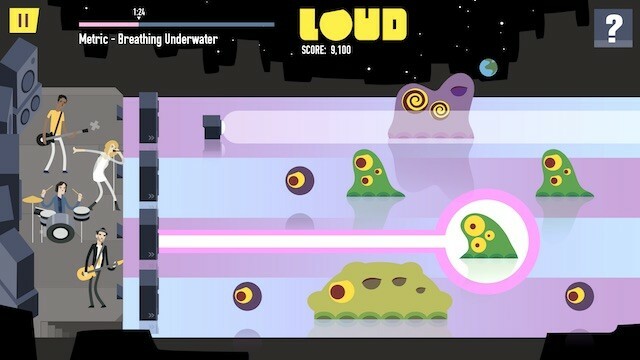 Outside of these problems, LOUD on Planet X is a nice, but basic-looking, game, and one that is easy to support. Its visuals may look rather simple, but a lot of love was put into recreating each band’s members in vector art. The bands, themselves, have their own slight gimmicks, including Tegan and Sara’s striped shirts and another band’s lead singer, who de-clothes on stage. The music is the real standout, though, because it’s truly excellent and combines to be the soundtrack that Amplitude 2015 should have had. 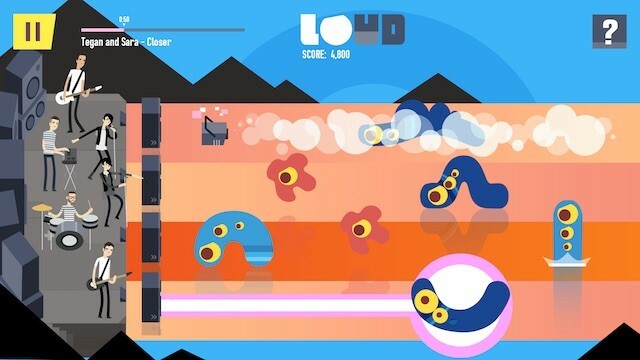 So, if you’re looking for something interesting, relatively unique and pulse-pounding, look no further than LOUD on Planet X. It’s not a flawless game, but it gets to be pretty fun once you get the hang of how it works, and presents a fantastic soundtrack that rivals most other music games as far as quality goes. This review is based on the PlayStation 4 version of the game, which we were provided with.